Emily Bronte (July 30, 1818 — December 19, 1848) – Poet and Novelist; famous for her classic novel Wuthering Heights. 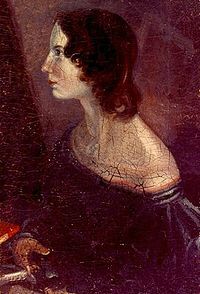 Emily Bronte was born 30 July 1818 in Thornton, Near Bradford in Yorkshire. She was the fifth of six children, including Anne and Charlotte Bronte, who both became writers as well. Photo left – portrait by her brother. Emily Bronte, A Little While, a Little While (1846) Stanza vii. Her father was made the local curate of Haworth, and the family lived there for the remainder of their lives. The old vicarage is now a museum dedicated to the Brontes. Shortly after moving to Howarth, Emily’s mother passed away. The girls were then sent to the Clergy Daughters’ school at Cowen Bridge. In the aftermath of her mother’s passing, this was a traumatic experience as the sisters found the school harsh and unsympathetic. This school experience was incorporated into Charlotte Bronte’s Jane Eyre. During a typhus epidemic, Emily lost two of her sisters (Maria and Elizabeth) to the illness; shortly afterwards Emily returned home where she was educated by her father and aunt. For a brief period, when she was 17, Emily went to Roe Head girl’s school where Charlotte was a teacher. But, due to homesickness she soon returned home. This certainly applied to her father, who was quite reclusive and liked to dine alone in his room. Domestic life for Emily was undoubtedly made difficult by her brother, Branwell who suffered from mood swings, influenced by his alcohol and drug addictions. Branwell died in 1848, shortly before Emily. From an early age, Emily began writing displaying a vivid imagination. Her early writings were in collaboration with her sisters and brothers about an imaginary world (Gondal saga). Only small fragments remain from this period. She continued writing throughout her life, though it became an increasingly private affair; initially, she disliked the idea of her poems being published though she was persuaded on finding her sisters had been writing similar poems. In 1846, the three Bronte sisters published a collection of poems under the pseudonyms Currer Bell (Charlotte), Ellis Bell (Emily) and Acton Bell (Anne). The fact they chose masculine names suggests they wanted to avoid the prejudgment of female writers. At the time, it was rare for women writers to be published. In 1847, she published her only novel Wuthering Heights. 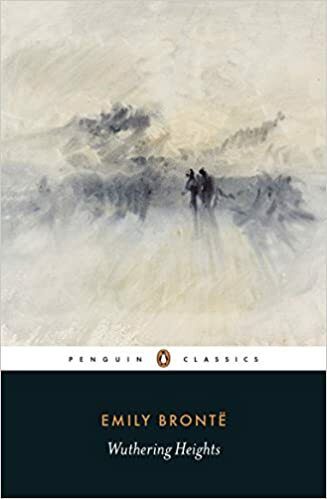 Based on the windswept moors of Haworth, it is a powerful tale of love, hate, sorrow and death; it later became a classic of English literature. Though at the time, its innovative structure and complexity led to mixed reviews. In 1850, her sister Charlotte republished the book under Emily’s real name. Frail throughout her life, Emily fell seriously sick in the autumn of 1848. Her health was undoubtedly harmed by unsanitary water which drained from the nearby churchyard. Shortly after her brother’s funeral she caught a serious cold, and refusing medical help, she died on 19 December 1848. Emily Bronte left little writings about herself. Often, her poems and novels have been scrutinised for autobiographical hints. However, it is difficult to fully ascertain which poems are just imagination and which relate to part of her character. Her writings have been included in the broad period of romanticism. They range from stark reminders of the harshness of life, to the potential beauty and power of love and a mystical power of nature. Citation: Pettinger, Tejvan. “Biography Emily Bronte”, Oxford, UK – www.biographyonline.net. Last updated 3rd Feb 2018.